A 1500 kb webfont, really? There is a serious issue with the Adobe Webfonts (Minion Pro, Caslon, Garamond, Adobe Text Pro…) currently served by Typekit: they are practically unusable for languages other than English, because of their enormous filesize. Typekit gives us two choices for language support: only English (“Default”) or other languages (“All Characters”). That’s fine for a font like Gesta, that I am using currently on this site, where the “Default” version (for Regular) amounts to 40k, and the “All Characters” version 53k (supporting Catalan, Czech, German, English, Spanish, French, Italian, Dutch, Polish, Portuguese and Swedish). That’s what I use here, since some of my content is in French. The biggest culprit is Adobe Text Pro, where we see 52k/454k for Regular alone, 197k/1509k if we use Regular, Italic, Bold and Bold Italic. A look at the supported languages shows: Catalan, Czech, German, English, Spanish, French, Italian, Dutch, Polish, Portuguese, Russian and Swedish. Probably the Russian alphabet is having a big impact here. This doesn’t really make sense, if you want to support a simple latin-alphabet language with some funky diacritics. Please, Typekit/Adobe, give us an option for subsetting your fonts for a specific language (or group of languages). Otherwise, your broad language support is actually backfiring on webdesigners. Yes, making Web fonts with optimized file sizes is quite a challenge. What do you think of the approach taken by Fonts.com? 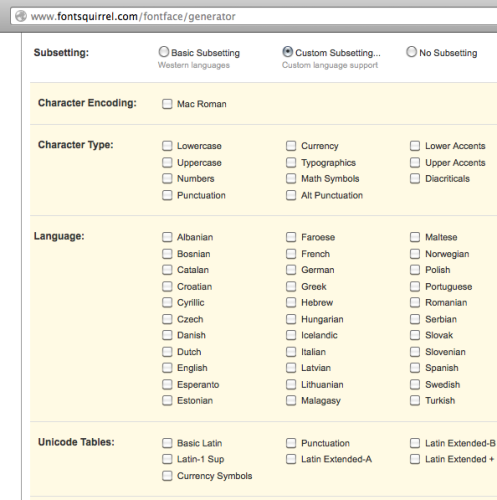 For their Web font service each font is offered in different language grouping subsets. For example Latin 1, Latin Extended, Greek, Cyrillic, Hebrew, Arabic etc. And for very large fonts that include Chinese, Japanese and Korean, a dynamic subsettting technique is used to make smaller font files on the fly. I’d be interested in knowing if you think this approach is more of what you are looking for. 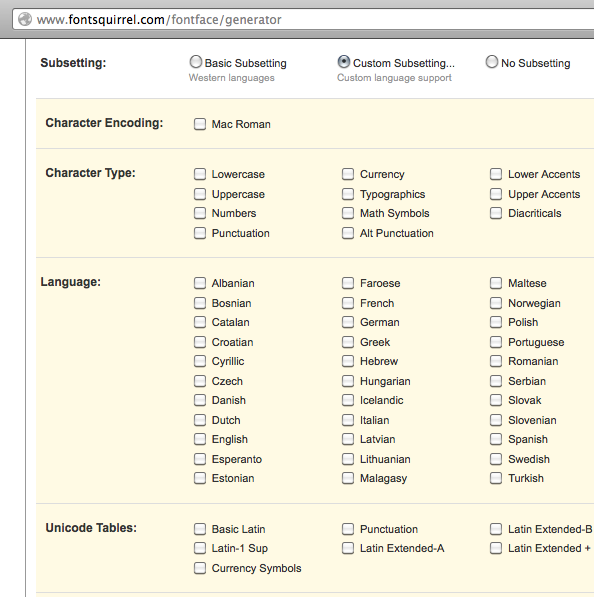 Yes, the way that Fonts.com lets you select a subset is a very good solution! I would really expect Typekit to offer a similar range of options. The most flexible solution I know of is the “custom subsetting” option offered by Fontsquirrel’s @font-face Generator – but for most cases it’s actually too detailed.